If you get an answer to the first question, you have an action verb. If you get an answer to the second question, you have a linking verb. Archie flew around the room and then swooped into his cage for a birdseed snack. you ask “What’s happening?” and your answer is flew and swooped. Flew and swooped are action verbs. 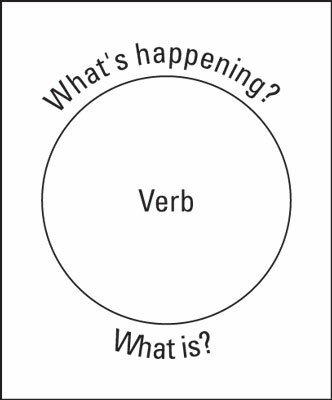 If you ask, “What is?” you get no answer, because there’s no linking verb in the sentence. Lola’s new tattoo will be larger than her previous fifteen tattoos. What’s happening? Nothing. You have no action verb. What is? Will be. Will be is a linking verb. Pop the question and find the verbs in the following sentences. For extra credit, identify the verbs as action or linking. A. Michelle scratched the cat almost as hard as the cat had scratched her. B. After months of up-and-down motion, Lester is taking the elevator sideways, just for a change of pace. C. The twisted frown on Larry’s face seems strange because of the joyful background music. Answers: A. scratched is an action verb, had scratched is an action verb. B. is taking is an action verb. C. seems is a linking verb. You may hear English teachers say, “the verb to sweep” or some such expression. In fact, to be is not actually a verb. It’s an infinitive. An infinitive is to + a verb. (Some grammarians see the to as an add-on and count only the verb as an infinitive.) Don’t worry about the terminology. The most important thing to know about infinitives is this: When you pop the question to find the verb, don’t choose an infinitive as your answer. If you do, you’ll miss the real verb or verbs in the sentence. Other than that, forget about infinitives!